Meagan Duhamel and Eric Radford of Canada perform their long program at 2016 Skate Canada. 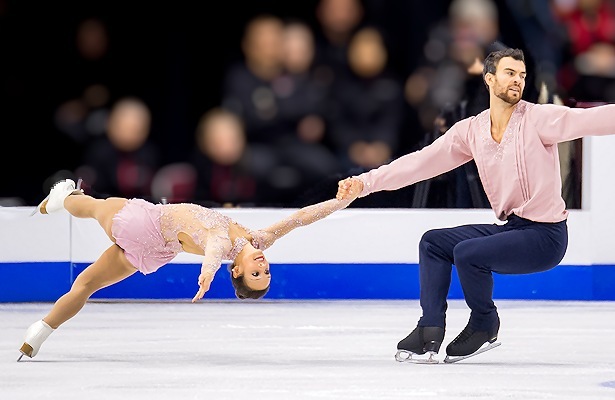 World champions Meagan Duhamel and Eric Radford skated their mesmerizing free skate to “Non, je ne regrette rien” with heart and chutzpah, showing steady improvement since Finlandia Trophy earlier this month. The team earned a free skate score of 139.91 for a total combined score of 218.03. Duhamel said she thought the performance was a solid start to the season, particularly after their personal best scoring short program. The program wasn’t picture perfect however. A collapse on the landing of the throw quadruple Salchow, a two-footed landing on the side-by-side triple Lutz by Radford, and a two-footed finish to the final double toe by Duhamel on the triple toe-double toe-double toe combination marred the performance. The newly-formed Chinese team of Xiaoyu Yu and Hao Zhang skated a delicate performance to “Cavatina” and “Larghetto amoroso” which included clean side-by-side jumps and a throw triple loop and Salchow. They scored 132.65 for a total competition score of 202.08 to win the silver medal. The team says they have no immediate plans this season of practicing quadruple throw jumps or twists or performing them in competition. Winning the bronze was the popular team of Liubov Ilyushechkina and Dylan Moscovitch, who represent Canada. Despite several errors throughout the program, the team was able to manage a clean throw triple loop and showed dynamic chemistry during their free skate to “When you Say you Love Me” by Josh Groban. After their silver at Skate America and the Grand Prix Final qualification buzz that came with the medal, Americans Haven Denney and Brandon Frazier were nudged off the podium despite their enchanting performance to “Somewhere in Time.” Dressed in vibrant blue, the team won 121.73 in the free skate for a total competition score of 188.23. Errors on the side by side jumps were compensated by strong throw triple jumps and a level three twist. “I think after being off for so long, I have a different appreciation for being able to compete again and I hope my joy, my love for what we’re doing is showing,” Denney said of her exuberant joy throughout the program. Yuko Kavaguti and Alexander Smirnov of Russia finished fifth. Two-time world champions Duhamel and Radford landed their first throw triple Axel in a short program marred only by Duhamel’s free leg sweeping across the ice upon the landing. The techno routine set to Seal’s “Killer” played a perfect backdrop to what Duhamel calls the team’s “unique, innovative” movements which help distinguish them from the competition. Apart from the throw jump, Radford had a squirrely landing on his side-by-side triple Lutz. The team was awarded a score of 78.39. “To start the season with a Personal Best, the highest international score we’ve every had, that was an amazing way to start the season,” she added. Frustrated by the inability to attempt a quadruple in the short program last season, the five-time Canadian champions decided to chase a triple Axel to boost their base value this season. A clean short program at last year’s world championships still left Duhamel and Radford behind the Chinese team of Wenjing Sui and Cong Han. Though the Montreal-based coaching team was originally non-committal about the high-risk throw continuing all season long, their tune changed moments after the short program. Following the team’s showing earlier this month at Finlandia Trophy, in what Duhamel described as “disastrous,” the team regrouped and tweaked the program. With a change in the element order that places the throw jump attempt sooner in the program and a tighter, faster entrance pattern, Marcotte says Duhamel feels more confident about the trick nowadays. Yu and Zhang were second after a clean skate, which was punctuated by a soaring level four triple twist, that snared 69.43 from the judges. This is the first international competition for the team who were part of an intriguing teammate partner swap when Zhang left his former partner Cheng Peng and Yu left Yang Jin. Peng and Jin now skate together. Zhang said the duo was formed when coach Hongbo Zhao first tabled the idea following the last world figure skating championships. Ilyushechkina and Moscovitch were third with a score of 67.53 after their passionate “Tango Jalousie” routine. Their only error came on the side-by-side Salchows which Moscovitch botched with a hand down and Ilyushechkina doubled. The duo – one of three pair teams in Canada clamoring to break out from Duhamel and Radford’s vast shadow – admitted that the win by teammates Julianne Seguin and Charlie Bilodeau at Skate America last weekend fired them up and influenced the third-place skate. Denney and Frazier were fourth after the short program in which Frazier two-footed and stepped out of the landing of the side-by-side triple Salchow.